ITP - Immune Thrombocytopenia, is an autoimmune disease. In autoimmune diseases, the body mounts an immune attack toward one or more seemingly normal organ systems. In ITP, platelets are the target. They are marked as foreign by the immune system and eliminated in the spleen and sometimes, the liver. In addition to increased platelet destruction, some people with ITP also have impaired platelet production. Platelets are relatively small, irregularly shaped cells of our blood. They are required to maintain the integrity of our blood vessel walls and for blood to clot. Without a sufficient number of platelets, a person with ITP is subject to spontaneous bleeding or bruising. 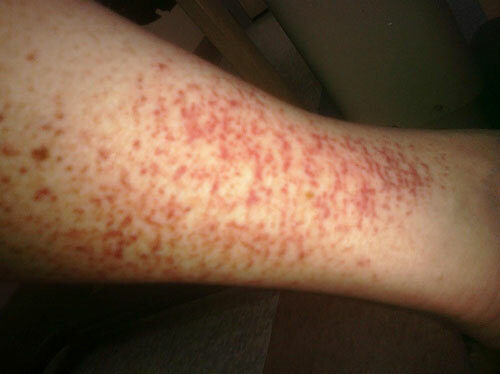 People with ITP often have bruises or small purple spots on their skin (petechiae) where their blood has escaped from their veins or capillaries. Spontaneous bleeding can also occur in the mucus membranes on the inside of the mouth or in the gastrointestinal tract. It is possible, with a decreased number of platelets, to have a spontaneous cerebral hemorrhage. ITP is often accompanied by fatigue and sometimes depression. Normal platelet counts range from 150,000 to 400,000 per microliter of blood. People with platelet counts under 10,000 have a severe case of ITP. 30,000 is sufficient for many to prevent a catastrophic bleed. Individual reactions to low platelet counts differ. Determining a safe platelet count is a decision to be made in consultation with an experienced treating physician. It is difficult to determine how many adults have ITP, so estimates vary. One study reports that the incidence of adult ITP (how many people get diagnosed each year) is from 1.6 4 to 6.6 5 per 100,000. The prevalence (how many adults have ITP at any time) is approximately 9.5 cases per 100,000. More women than men have the disease in the 30 to 60 age group. In other age groups, about the same number of men and women are diagnosed with ITP. About 4.3 to 5.3 per 100,000 children are diagnosed with ITP each year. Since children with ITP usually recover, the number of children who have ITP at any one time is about equal to those diagnosed annually. While most cases of ITP are controlled, it can be fatal in a small percentage of ITP patients.